Firmly entrenched now as the Houston Texans starting quarterback, Matt Schaub was originally taken in the 3rd round of the 2003 draft to be insurance for Mike Vick in Atlanta. An incredibly accurate passer at Virginia, Schaub held many Cavalier and ACC records upon graduation. Schaub would quickly establish himself as a budding quarterback, starting 1 game in 2005 against the Patriots where he threw for almost 300 yards and 3 touchdowns in relief of the injured Vick. He’d also see playing time in mop up duty in 4 additional games. In early 2007 the Houston Texans traded the Atlanta Falcons 2 second round choices (07,08) and swapped first rounders so that the Texans could lock up Schaub. The Texans’ and Matt Schaub’s timing coming together was fortuitous, as incumbent starter David Carr was released the same day as the trade was consummated (making Schaub the de facto starter), and shortly thereafter news broke about Atlanta quarterback Michael Vick’s dogfighting. Although early on the reviews on Schaub were mixed due to injuries, Schaub did establish team records for passing in a game (497), team record, (with marks of 8-8 and 9-7,) passing yards (4,770) and all of the other relevant Houston Texans passing records. Schaub’s 4770 yards in 2009 led the NFL and he was Pro Bowl MVP in 2010. Matt is a good mid-range passer- excellent for the West Coast System that the Texans employ. He’s got good vision and is a leader on the field. Matt stands tall in the pocket but has been prone to be completely oblivious to his surroundings (which is often just as much the fault of his line) checking down and rechecking down receivers instead of scrambling upfield. Defenses have already made this adjustment, daring him to scramble by dropping sometimes off into deep zones. I’d also like to see Matt be able to audible more to take advantage of mismatches at the line of scrimmage. Otherwise, since Schaub has arrived the Texans have become a dangerous offensive team especially when paired with Andre Johnson. He’s a great budget buy in Fantasy Football leagues, and helped me win my fantasy football league 2 years ago handcuffed to Andre. 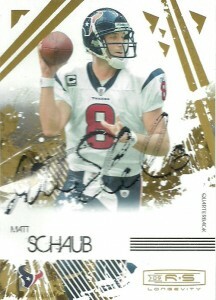 Like many Texans I am still awaiting an autograph from Matt Schaub as part of a major autograph blitz. Things continue to look up for Schaub as the Texans in 2011 hope that he will lead them into the playoffs for the first time. I really like this card and I think Donruss hit it out of the park with their design taking Leaf’s previous series and really ramping it up. It does feel very trendy for the time with the worn look, but is it timeless? There’s good use of white space and while I’m not the biggest fan of the type family “Birth of a Hero”, it suits the design well. The gold reflective surface is nice, but I have never been a fan of high gloss cards since they make players’ signatures smear and pool. So I had a little fun at the end of 2008, putting the Apex Card together. -If only I had access to high resolution imagery. Oh well. It was still a fun exercise taking a Texans photo of Matt and then changing the colors of his uniform to my fantasy football team, the Pasadena Riders, who won the Fantasy Football Championship in 2009. While my team did not fare as well in 2010 (4th out of 12 teams), I still managed to make the playoffs again despite not having Andre or Matt on my team. Futura and usage of small caps came in handy here with Pro Set being a definite influence on the design. 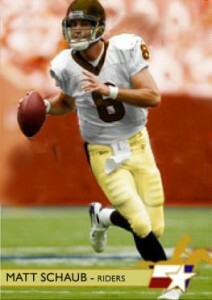 I manipulated the uniform by placing Matt on a mask, then colorizing him separately utilizing the color tool in Photoshop. Originally it had FANTASY IMPACT written across the card too, but I thought it was a bit over the top so I removed it in the end. There’s still some artifact ‘bitmappery’ I still need to clean up, but overall not a bad first stab.